Europeans love vertical races—and the more up, the better. Steep vertical kilometer or “VK” races are commonplace. They happen throughout the year, with trail running shoes giving way to snowshoes, climbing skins and other forms of winter traction, as grassy alpine slopes turn white in the winter months. Nowhere in the Alps do they love vertical races more than Italy, home to the Skyrunning Federation (“More Sky, Less Clouds”). 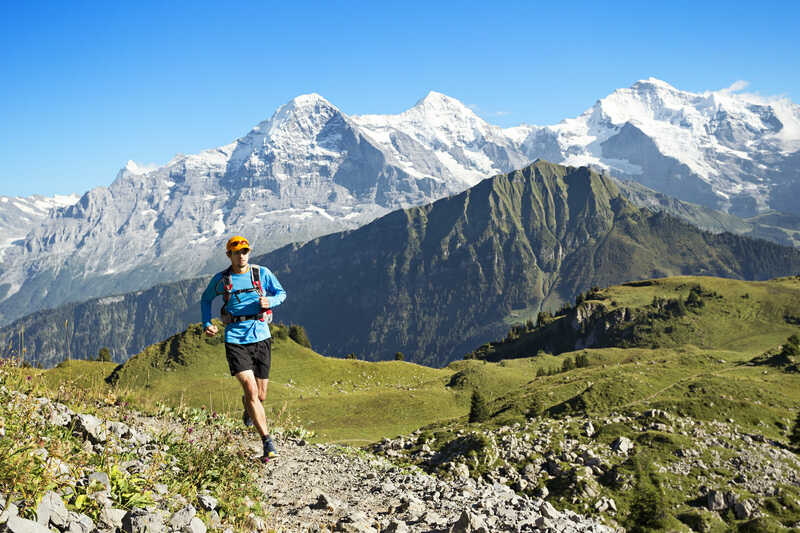 Since 1993, the organization has been promoting running up to, and then through, the Alps. Now, its reach is worldwide. The race start, under an arch built in 8 BC. In the distance, two nuns walk to morning services. And nowhere in the Alps can runners race up—steeply up, in one continuous push—more than from Val di Susa, Italy. Located in the Piedmont region, not far from the French border, the Roman city of Susa is home to the Red Bull-sponsored triple vertical kilometer—the world’s only triple VK. This year, the race was part of Skyrunning’s Vertical Kilometer World Circuit, attracting some of the best uphill runners to be found. Why Susa? There are several reasons. First, nearby Rocciamelone rises to a height of 3,538 meters—3,035 meters above the town’s center. Second, Susa’s far enough south that summits are snow-free come summer. Finally, the topography here tilts vertical, allowing runners to climb each 1,000 meters in less than 5 km of distance—the recognized standard for a vertical kilometer event. In other words, the region is uniquely suited to running up. The Red Bull K3 is just one such example, with a course that climbs 3,000 meters over an incomprehensibly meager distance of 9.7 kilometers. Rocciamelone has an interesting history. It’s the first mountain in the world for which there is a first ascent date. On September 1, 1358, local nobleman Bonifacio Rotario D’Asti gained the summit. It wasn’t the first attempt, though. Rocciamelone, considered the highest summit in the Alps for centuries, had been previously attempted by both knights or monks. Today, the mountain continues to see pilgrimages from Catholic worshippers. This year’s race took places under nearly ideal conditions, without storms or sweltering heat, and with a thin layer of clouds veiling the sun from runners on the mountain’s tree-free upper slopes. In all, 363 runners started—309 men and 54 women. The race begins under the 2,025-year old Arch of Augustus in the old village, but the timing clock doesn’t start until the first runner reaches Susa’s outskirts, two kilometers away, where the climbing begins in earnest. *Running through the narrow, ancient cobblestoned roads of Susa, with residents either cheering “Bravo!”and clapping… Or, shaking their heads, utterly confounded that hundreds of runners from more than a dozen countries would willingly subject themselves to the climb ahead. *Looking skyward at the endless climb. In a 10-km race with 3 km of vertical, there’s not a moment when glancing skyward isn’t at least a bit demoralizing. Until you’re done, there’s always more up. *Looking down and taking in the sense of forward motion. Watching your feet move quickly over centuries-old cobblestones on a mountain path helps you realize the finish line will arrive, eventually. *Looking at my watch. This time, it wasn’t giving the numbers I wanted. I needed to tick off at least 100 meters of vertical every six minutes for more than two hours, to pass the second time barrier. *Noticing the odd damp splotches covering the path’s stones, growing in number as we climbed higher. My addled brain took a moment to sort it out: sweat from the hundreds of runners ahead of me. *A chance to stretch legs and run at 1,000 meters. More than a third of the way up the course, we got a horizontal reprieve along a wooded, forest track, and then through cow-dotted pastures for a kilometer. My legs loved it. *Reaching the notoriously steep, grassy slope. Some runners stowed their poles, opting to free their hands in order to grab at the grassy tufts. Others, myself included, stuck to old habits, balancing our bodies precariously between earth and sky as our centers of gravity shifted upward with each double-pole plant. *His toe-hold gone, watching the runner in front of me suddenly slide past. A moment later, losing balance, my turn came. I ended the race with a first: a grass stain on my forehead. *Hearing Race Co-Director Nico say, “Stop!” as he marked my bib with a green “X”at 2,300 meters above Susa and 700 meters below the summit. Today’s run was over. In 30 years of trail running, it was my first DNF. I felt both deep regret and relief. There were more than a few of us, with over a third of the highly competitive field being forced out. Susa’s Red Bull K3 was a typically Italian event, which is to say, organized where it mattered most and arguably a bit of a free-for-all elsewhere. (Was there a pre-race briefing? Oh, who cares… let’s go!). And it was 100% Type 2 fun, right in keeping with Italy’s mountain running traditions. A day later, as the jumbled movie of Susa’s K3 continued to replay itself in my mind, I turned my attention to the long drive back to Chamonix, France. The European home for Run the Alps, Chamonix is the world’s center for extreme alpinism, and the town is arguably also the world’s capital for trail running. There’s even a vertical kilometer course right in town. On the drive back, however, Chamonix seemed a town whose beehive of trail running activity was, at least for a brief moment, timid in comparison.